Narrated by Deepak Chopra, M.D. From the New York Times Bestselling Author. Can God be revived in a skeptical age? What would it take to give people a spiritual life more powerful than anything in the past? 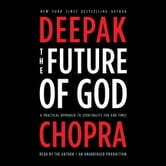 Deepak Chopra tackles these issues with eloquence and insight in this book. He proposes that God lies at the source of human awareness. Therefore, any person can find the God within that transforms everyday life. God is in trouble. The rise of the militant atheist movement spearheaded by Richard Dawkins signifies, to many, that the deity is an outmoded myth in the modern world. Deepak Chopra passionately disagrees, seeing the present moment as the perfect time for making spirituality what it really should be: reliable knowledge about higher reality. 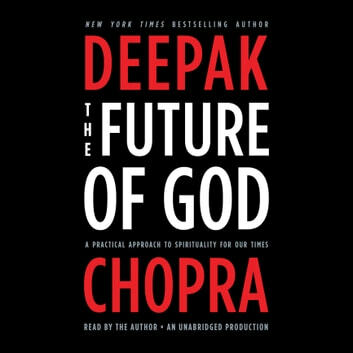 Outlining a path to God that turns unbelief into the first step of awakening, Deepak shows us that a crisis of faith is like the fire we must pass through on the way to power, truth, and love. For three decades, Deepak Chopra has inspired millions with his profound writing and teaching. With The Future of God, he invites us on a journey of the spirit, providing a practical path to understanding God and our own place in the universe. Now, is a moment of reinvigoration, he argues. Now is moment of renewal. Now is the future.